December 01, 2018 / April A. This post is sponsored by Command™ brand. I love the holidays. Cheery Christmas music, gathering all my favorite decorations to tuck into every nook and cranny of my home and our favorite sweet treats we only eat once a year. This year we live in a lovely pre-war home with two fireplaces which means I get to decorate two mantels. I'm so excited. I get to create two pretty Christmas vignettes on each one. I love the fall/Thanksgiving decorations I have on my dining room mantel. It's made of a beautiful old growth oak wood. To keep the pretty wood intact I am using Command™ Clear Mini Hooks that are easy to apply and easy to remove without hammering holes in the wood for a damage-free holiday. I wanted to create a lovely transitional garland that I can have up with my Thanksgiving decorations that I can also have up for Christmas. 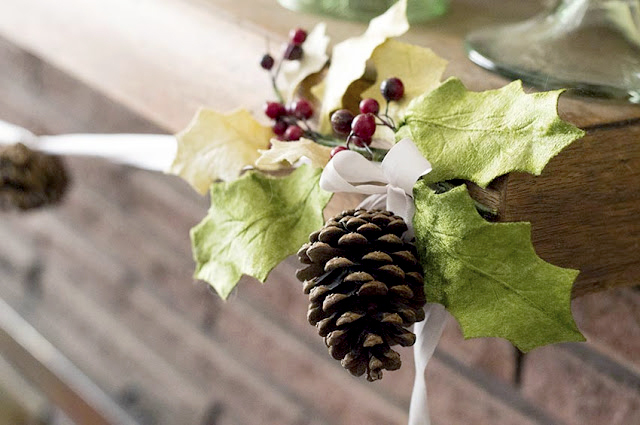 This simple pinecone garland is a perfect easy DIY Christmas decoration or Thanksgiving decoration anyone who can tie a simple knot and bow can make. Gather and wash your pinecones. Cut a length of 2 1/2 yards of ribbon. If you are feeling sparkly you can add some glitter to each pinecone too by simply brushing some glue on the pinecones and dusting with glitter. Wrap the ribbon around the bottom of the first pinecone and tie it in a double knot. Repeat spacing the pinecones apart about 5 inches. Tie two bows from the ribbon leaving long tails to top each end pinecone. Glue the bow on the top of the end pinecones. Next, I simply added a Christmas craft pick tucking it into the Command™ Clear Mini Hook to hold it in place. The nice thing about using the Command™Brand Hooks is you can quickly change your decorations if you change your mind without damage. I'm also hanging my wreaths on my windows using Command™ Brand Hooks. Did you know you can use them on glass? Be sure to clean the glass well before adhering the hooks. On my enclosed porch I'm hanging these pretty velvet and grapevine wreaths on the windows using the Command™ Medium Designer Hook which can hold up to 3 pounds which is perfect for hanging wreaths. 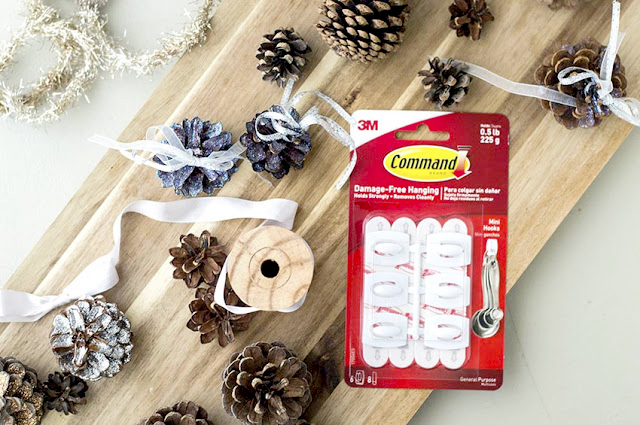 You can find more ways to use Command™ Brand Hooks for your holiday decorating here at Command™ Brand Holiday.